Not to be confused with the original "Big Yo" weighing 256 pounds and measuring 4.5 feet diameter, made by Tom Kuhn in 1979. YoYoJam's Big Yo is a take-apart design with a bearing axle, but no side caps to identify the name of the yo-yo. Glow in the dark. 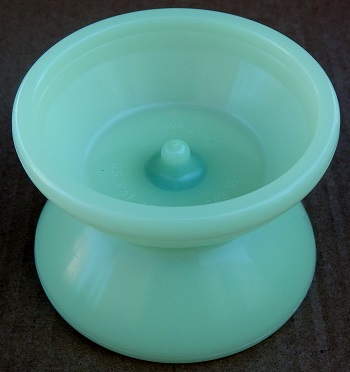 These yo-yos did not come with a warranty because, at the time, they were considered test pieces. Those first "test pieces" ultimately turned into a full production model. It uses an o-ring response system. Initially, it was released in limited quantities but, as mentioned above, it has been in production since then and today (as of January, 2016) is still available from several websites. The version sold today contains only very minor modifications since its initial release. Holds U.S. patent number 6,206,749 B1. YoYoJam officially closed its doors for business Wednesday, December 30, 2015.